When people visit Australia they usually have a few things on their to do list. Visit Bondi beach, see the Sydney opera house, and snorkel in the Great Barrier Reef. Very rarely do these plans involve Western Australia, much less the little corner that makes up the South West. The South West region consists of Bunbury (Western Australia’s third largest city), Margaret river, Dunsborough, Busselton, Augusta and Yallingup, as well as some smaller townships. The region is bounded by Cape Naturaliste to the North and Cape Leeuwin to the South. Caves Road is a major tourist road which connects many of the attraction of the South West. We love driving this road as it leads to so many small beaches and cute little attractions! Forget Bondi, WA beaches are where it’s at! My favourite thing about the South West is that even on the prettiest Summer’s day I can still find an empty beach to enjoy. There are so many beaches to explore and they tend to be largely untouched, litter free and unpopulated. Along the coast there are plenty of pretty rock formations to explore. As you drive down caves road you’ll see roads titled things like Moses rock, sugar load rock, canal rocks, etc. If you follow these roads you’ll find that they’re quite aptly named, and there’s always some sort of rock formation at the end of them. Canal rocks is the most popular and it’s really enjoyable to climb around this massive mountain of rock, but there are tonnes of others to discover too! There are also numerous coastal walks to enjoy from the 250 km cape to cape track, to the 7km Meelup reserve trail. There are wild beaches perfect for surfing like-injidup beach in Yallingup-and sheltered beaches perfect for families, like koombana bay in Bunbury. There’s plenty of fishing opportunities and in the right seasons you might see whales or Dolphins! When I first arrived in Bunbury I visited the art gallery quite frequently. At the time it was one of the few free things to do on a Sunday. Today you don’t even need to visit the galleries to be wowed by Bunbury’s art scene, it’s all around us! Street art in Bunbury is becoming increasingly wide spread and it’s impossible to walk around the city without noticing a new piece of art you hadn’t seen before. The street art in the region is amazing! Empty shop fronts are turned into functional art galleries with the “artist in residence” program, and there are unique artsy stores like Afez of the Heart (specialising in middle eastern furniture) and Lava Art Glass Gallery, a store/studio/gallery selling Western Australian glass art and providing glass making workshops. Yallingup, a small town about 250km south of Perth has its own thriving art scene. The Yallingup galleries consist of a main gallery showcasing a range of Australian artists, and a garden art studio which hosts solo exhibitions. Not far from here are the Gunyulgap galleries. In fact, you could spend days driving down caves road and stopping at all the art galleries you see signposted along the way! To see traditional aboriginal artwork visit the Wardan aboriginal centre, also off caves road. The south west region rules when it comes to booze! Margaret river is a famous wine region with many vineyards and wineries. Wine tours are a great way to explore many of the wineries in the area without the need for a designated driver, and range from limo tours to group bus tours. But it’s not all about the wine! The south west region is also awash with craft beer breweries and artsy small bars. Tap takeovers (when a local brewery takes over the taps at a bar for a night) occur in bars such as Lost Bills in Bunbury and are a great way to try local beers. Alex is a craft beer fanatic and he strongly recommends Eagle Bay brewing company, a microbrewery and restaurant near Dunsborough. Unique bars are popping up constantly. When we first walked into Sala in Bunbury I really felt like we were back on Abbot Kinney boulevard in Los Angeles! It’s such a hip little spot with exposed brick walls, a huge wine and beer selection, and delicious sharing plates. It’s just one of the many exciting bars dotted across the South West. 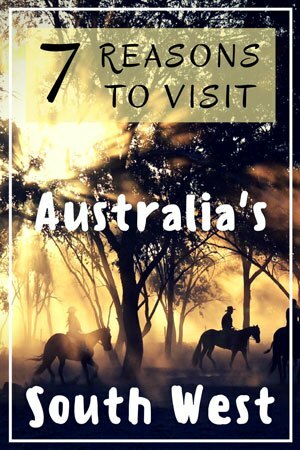 Alcohol is much more expensive in Australia than in many parts of the world, and WA is even more expensive, but visiting a few local bars is a great way to experience local culture, hear some local live music, and try some local drinks. Clancy’s Fish Pub on Caves Road. The South West has so many wonderful food options. From vegan raw food options at The Plant in Bunbury to the famous chilli beef burger of Occy’s in Dunsborough, there truly is something for everyone. You can visit the Margaret Rivera in the small town of Cowaramup and sample their selection of locally made chutneys, olive oil and cheeses, or try handmade chocolates at the Margaret river chocolate factory. For a real delicacy take a trip to the small inland town of Manjimup, a place famous for its truffles. If you love markets (which I most definitely do!) you need to visit the Margaret River farmers market which takes place every Saturday morning from 8am-12pm at the Margaret River education campus. Here you can sample everything from nougat to fresh fruit to Yallingup’s famous wood fired bread. The Happy Wife – a cafe with a view. Stop for a coffee in one of the dozens of cute cafes in the region. The Happy Wife in Bunbury is one of our favourite Sunday morning spots, with beautiful views of the inlet and wonderful breakfast and lunch options. The honeycomb crumpets are divine! Hot Chocolatte in Dunsborough is a cute little hole in the wall coffee shop with everything from chia pots to fudge brownies, and their flavoured hot chocolate is so decadent it almost makes you feel guilty….almost! Walk through the Main Street of Margaret river and you’ll find it’s always bustling with people enjoying their lunch alfresco in one of the many bohemian style cafes. Coffee shops in this part of the world aren’t about soup and sandwiches, they’re always taking things to the next level with surprising flavor combinations, cute decor and Instagram worthy presentation. Don’t miss out on the coffee! The South West region is the only place in the world where you’ll find tuart forests. This creates a natural ecosystem unlike anywhere else in the world! The Tuart Forest National Park is a protected area when you can explore this unique bush land. There are multiple walking trails where you will see beautiful flora and perhaps even encounter some wildlife. The night spotlighting trail is a 1.5km walk intended to be explored at night by torch light to allow you to see the native nocturnal wildlife like the western ringtail possum! One of my favourite aspects of the Australian landscape is bush leading straight to the sea. There’s something so exciting about coming over the top of a bush trail to find the beach laid out before you! The Maidens reserve in Bunbury is a wonderful example of this! The facilities here are old and the water fountains have rusted, but the trails are beautiful and fairly well maintained. It’s an area full of wildlife from butterflies to snakes, and the beach is usually almost empty! Go for a hike in the forest. So many people drive all the way to Monkey Mia, ten hours North of Perth to experience Dolphins in their natural habitat. But in Bunbury, just two hours South of Perth we have our own dolphin experience. The beaches around Bunbury teem with dolphins. I’ve even had them swim up next to me when I was least expecting it! The dolphin discover centre is a non-profit organisation which offers a range of educational activities from guided swims to Eco cruises. Admission to the centre is $10 while a guided swim will cost you $165. Tourist activities involving animals can be an ethical issue, with terrible stories emerging about abusive elephant tourist traps in Thailand. When visiting the Bunbury dolphin discovery centre you can rest assured that you’re not harming these Dolphins. The centre has the highest level of Eco certification and is committed to positively impacting the natural environment. Caves road is aptly named-all along this road are limestone caves! There are actually over 150 caves across the south west region and many of them are open to the public. They range from open easily accessible caves to extreme spelunking adventures. With an “Above and Below Pass” you can combine your entry to one of the more popular caves (such as Ngilgi Cave) and the Cape Leeuwin Lighthouse for just $26. We recently visited Mammoth Cave and it was really beautiful. Filled with natural unique rock formations, it was amazing to think that there’s this whole ecosystem beneath our feet! We love exploring the South West region of Australia. For us the only frustrating part is how difficulty it can be to find information about attractions in the area. Hopefully as the area continues to develop and grow this will improve. I have no doubt that in a year’s time this area will be even more exciting than it currently is! Ciara is an Irish traveler living in Australia with her American boyfriend, Alex. When not travelling she can be found avoiding doing the dishes and complaining about not travelling. They’re currently planning a road trip around Australia and share stories of their adventures on their blog, Our Migration Patterns. Yay – I was hoping this was referring to the south west of WA! This is our backyard, and one that we love very much. You’ve covered plenty of fantastic things to do in the area. There is something for everyone, regardless of what you enjoy or how much money you want to spend! What a fabulous blog post! Thank you for showcasing our spectacular South West Region!